“A sinful martial arts expert (Donnie Yen) wants to start a new tranquil life with his wife (Tang Wei), only to be hunted by a determined detective (Takeshi Kaneshiro) and his former master (Jimmy Wang Yu)” (Golden Screen Cinemas). 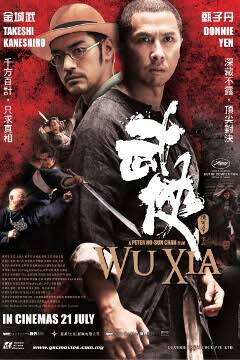 Verdict: This is not the typical kind of martial arts film you usually see from Donnie Yen. The movie actually emphasises more on the suspense and the drama to deeply elaborate a simple philosophy. The director, Peter Chan, also incorporated cool cinematographic tricks from detective shows like Sherlock Holmes for some of the scenes and they served the purpose perfectly. The first half of the film intrigues with its compelling plot and the ending delivers meaningful message of the story but then fails to engage the viewers emotionally. I also feel that Takeshi Kaneshiro’s performance here is not commendable. He has proven that he has improved as an actor in his previous roles but this one just didn’t suit him. The title: The film is also known as “Dragon” or “Swordsmen” in other countries. All of the names are actually misleading the people to think that this is a through and through kung fu movie. Censorship: Malaysian cinemas have had around three scenes skipped due to the gore and violence but it doesn’t significantly affect the movie. Second opinion: “I actually prefer this over a genuine martial art movie.” (Iris Loong). Much appreciation to Tanjong Golden Village Cinemas and Nuffnang for the TGV Complimentary Movie Passes.